It's that time of year again. 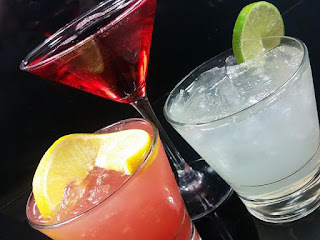 The love bug has bitten at the Uptown, so we're rolling out some new cocktails that will get even the most steel-hearted person swooning for the season. Starting with the Cherub's Cup. Our mixologists start with Absolut Citron and mix it with St. Germain Elderflower liqueur, a swirl of sweet simple syrup, and just a splash of lemon juice that will have you buzzing around like a Cherub. Next is one of our staples that we can't take off the menu due to such popularity over the years. Our famous Valentine Punch returns. A bubbly mixture of vodka, triple sec, pineapple juice, and cranberry juice is an instant and forever classic during the season. For all you new couples out there, the Flirtini is a perfect way to get the mood moving and break the ice. We've concocted a mix of vodka, triple sec, and pineapple juice with just a splash of pomagranate liqueur. Finally for a classic twist on an old favorite is the Razmopolitan. It starts with a generous helping of stoli razberri and chambord (raspberry liqueur) before it is finished off with triple sec and a splash of cranberry juice. Much like a classic cosmo, this adds a new twist. Love is in the air, and these cocktails are sure to help spread it around! Don't forget that Valentine's Day reservations are still available for you last minute planners out there!